These hunts are fast, exciting and exhilarating! We start out in 4x4 vehicles and ultimately travel on horseback and/or on foot. Well trained Big Game Hounds are utilized on these hunts and the chase is usually very rigorous. Excellent health and physical ability are mandatory for these hunts. 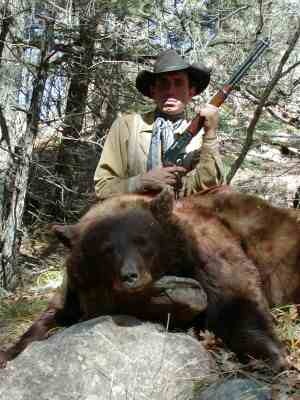 By NMG&F regulations, bear hunters must purchase their license at least two days before hunting. Licenses can be purchased by mail or online. Click on the link at the bottom of this page. One on one guide service. Transport of hide to a taxidermist in Santa Fe. Set the number of days you would like to hunt to suit your schedule. On this hunt the hunter can either take the first legal bear treed or bayed or he/she can release the bear and continue hunting after agreeing to pay half of the kill fee with the remainder of the kill fee due after an actual kill is made. Non-hunting companion Please Call For Pricing.